The one she brought me a few days later was the size of a small watermelon. The spikes made it difficult to handle. 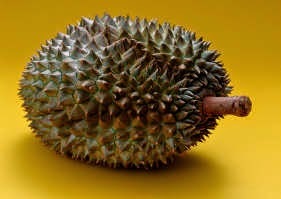 The fruit is called Durian, and it grows in South China. It is very expensive here in Weihai. To me, it looked menacing, and its odor was fowl, like a skunk. I tried to crack the thing with a knife my friend Lucy had left me, but I kept getting stabbed with the spikes. Its smell made it hard to concentrate on my work. Shutting it up in the bathroom did not help. I put the thing into a shopping bag and left it outside the room. Even from there, the odor was awful. Later that afternoon, my friend Daniel dropped over, and he was able to open the thing with a knife. It was tasty, its flavor resembling strong cheese and. There was far too much pulp for me to consume by myself in one sitting, so after we shared the fruit, Daniel wrapped up the rest to share with his family. I tidied my room, sweeping of scraps of Durian into a waste basket. It was time for class, and I was gone several hours. Upon my return, the room reeked of Durian peel. I emptied the trash—something I should have done earlier, but the room still smelled foul even after I turned on the fan and opened the windows. Last night, I felt as if I was sleeping with skunks. 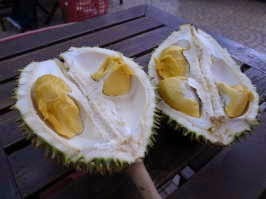 This morning, the odor is gone, and I wouldn’t mind eating Durian fruit again, under the right conditions. Really an interesting experience. I had never tasted it before since I had been afraid of the odor. But several years before, in 2010, when Jenny and I were in Cambodia, she bought one and asked me to try, I noticed it was delicious to eat despite of the odor.